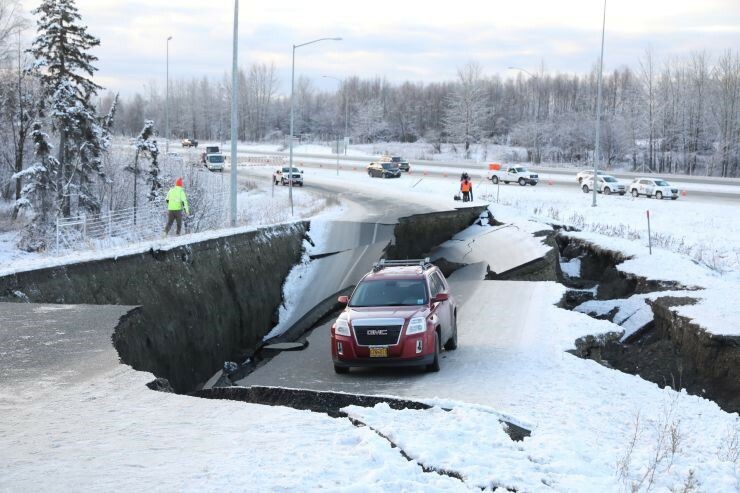 In November, Anchorage experienced a large earthquake which the U.S. Geological Survey said was of a 7.0 magnitude. No major damages occurred, but a tsunami warning was issued, flights were cancelled, the Alaska oil pipeline was shut down, and the school system in Anchorage canceled classes. Alaska has been hit by a number of powerful quakes over 7.0 magnitude in recent decades, including a 7.9 that hit last January southeast of Kodiak Island. But it is rare for a quake this big to strike so close to such a heavily populated area. A vehicle lies stranded on a collapsed roadway near the airport after an earthquake in Anchorage, Alaska, U.S. November 30, 2018. We rejoice that no lives were lost in the recent earthquake in Alaska. However, human affliction caused by natural disasters, affects people in the depth of their beings. These events in nature cause terror and anguish, fear and anxiety, distress and a sense of impotence. In the face of pain and death, people are inclined to ask, “Where is God?” In this post, I am not dealing with the theological issues raised by natural evil. Much has been written about natural evil and the amount of death nature inflicts upon human beings. According to a report released by the Associated Press, in the last 80 years 23 earthquakes of magnitude 6 or higher killed more than one million people. When people look at these numbers, they believe that earthquakes are a new phenomenon that is increasing in number and intensity. However, this is not true. Until the nineteenth century, the causes of earthquakes were poorly understood. The rise of the scientific study of earthquakes has demonstrated that earthquakes are the result of the incremental buildup of stresses within the earth over a period of many years. Eventually this stress is released causing violent movement of the earth in the form of an earthquake. One of the most important earthquakes in the Bible happened in the days of Uzziah, King of Judah, around 760 B.C. The call of the prophet Amos to the prophetic ministry is dated from this event: “The words of Amos, who was among the herdsmen of Tekoa, which he saw concerning Israel in the days of Uzziah king of Judah, and in the days of Jeroboam the son of Joash king of Israel, two years before the earthquake” (Amos 1:1). Josephus, the Jewish historian, mentioned an earthquake in the seventh year of the reign of Herod (31 B.C. ), an earthquake “such a one as had not happened at any other time, and which earthquake brought a great destruction upon the cattle in that country” (Antiquities XV, v.2). According to Josephus, about ten thousand people perished in the devastation caused by the earthquake. In the Old Testament, the manifestation of the divine presence is called a “theophany.” When God reveals himself, human beings are in awe and nature is in convulsion. Earthquakes were seen as demonstration of the power and the presence of God. The theophany of God to Moses on Mount Sinai was accompanied by fire, smoke, thunder, lighting, and earthquakes (Exodus 19:16-19). Earthquakes will continue to scare people because of the physical destruction they cause and because of the psychological and emotional stress they produce in their lives. For those who truly understand the message of the Bible, such a devastation confirms the biblical truth that “the whole created universe groans in all its parts as if in the pangs of childbirth” (Romans 8:22). No one can really understand the mysteries of nature and why they produce so much pain and suffering in the lives of people. However, when we look at the devastation caused by earthquakes, we begin to understand God’s word to Adam: “Cursed is the ground because of you” (Genesis 3:17). This entry was posted in Book of Amos, Earthquakes, Hebrew Bible, Old Testament, Theophany and tagged Amos, Earthquakes, Hebrew Bible, Old Testament, Theophany. Bookmark the permalink.